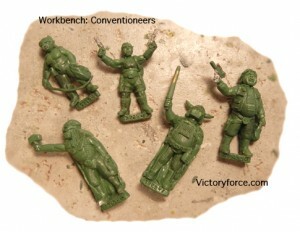 Victory Force gives us another view of their workbench with some SuburbaKnights they're working on. Since I changed the last group of figures from SuburbaKnights to Redd Redan I thought I had better do some SuburbaKnights. I decided to do some more Conventioneers. I am calling these the Chunk Bunch since all are on the heavy side. So far, I think I am going to call one the Dork Lord, others Ham Sandwich, Fem Feline, Lora Kraft, and Thor. At least for now.